I need to start by apologising to all of you for the really dreadful delay since my last post (which was about Edmund Crispin.) 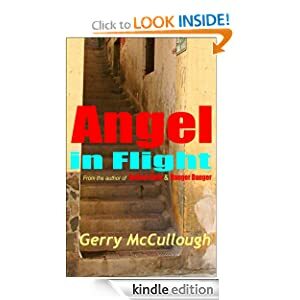 I've been snowed under finishing my new book, Angel in Flight, and editing it for my publisher. But now it's up, and I can relax! Until it's time to start writing the next one – this is the first of a series! You can buy it here, if you'd like to! I've had it in mind for some time now to write about a number of new books by writers I've recently come across. There are so many, it's really hard to choose which! But here's a selection of new books which I've discovered and thoroughly enjoyed. I think you'll like them too. They are Lallapaloosa, (Rags Daniels) The Blue Hour, (Stephen Hulse) and Mrs Jones (Babs Morton). They are all thrillers – and they may be 3 of a kind, but they have major differences as well. I'm giving you the publisher's description, and then my own view of each. Richard Strang thought he shared the world's best kept secret with no one. Then one summer evening, the tap of a blind man's cane, and a nose for the toasted Cuban leaf, changed all that. Now thirty years after the event, a chance encounter with a sinister blind stranger, and the discovery of Che’s final diary pages, causes the past and present to collide and explode into a tale of greed and treachery, survival and revenge. 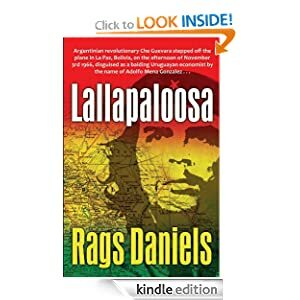 Inspired by a true sequence of events, ’Lallapaloosa’ tells in flashback the story leading up to the betrayal and 'capture' of the modern world's most famous revolutionary and master of disguise. This is a book you can't put down. The writing is slick, full of wit and excitement. Daniels has a sharp eye and a great gift for describing what he sees. Settings and characters come vividly to life. The first scene, the darkness, the lights of the town, the smell of the harbour, are beautifully evocative. The tap tap of the blind man's stick, his recognition of Strang, their talk in the pub - all this prepares us in its quick movement for gripping action. But the harsh events which follow are so unexpected and striking that nothing has really prepared us for them. We are left gasping and helpless. We have to read on. The story which follows is original, twisting and turning to its satisfying conclusion. Don't miss this book!
' "The French call this time l'heure bleu – The Blue Hour. The time between dawn and sunrise when the sun is below the horizon, and the world is awash with a hazy blue shadowed hue that suspends us between the accepted divisions of light and dark. It should have been beautiful. For me, it was now only beautifully deadly..."
This is exactly the sort of book I love reading. The references to Philip Marlowe, etc, as the hero Gideon is introduced, are a key to my preferences. The mention of Chinatown a few chapters later seals the delight. The story is told from the point of view of Alex Churchill, which is both original and fascinating. We are shown the hero – the Marlowe figure – from a female perspective for once – perfect! This story grips from the outset. And although Alex needs Gideon to come on the scene and rescue her from the gang of rapists, she contributes her own skills to their defeat, once she has his help. As we move on into the plot, we are no longer focusing on forties style events. The plot is bang up to date. If you can deal with this, it’s excellently told, with page turning, edge of the seat gripping action, and an enormous, impressive skill in detail. On top of this is the beauty of the descriptions. Gracie the squirrel is a wonderful touch; as is Madeleine, Alex’s mother, and their relationship; and the angel wings which seem to sprout from Gideon’s back at the appropriate times. The only thing missing from this book is a reference to the Saint, in the list of the other hard-boiled heroes. (I’ve just been re-reading the series, and realising how good the books are – so much better than the Roger Moore TV programmes!). But that’s a very minor point! 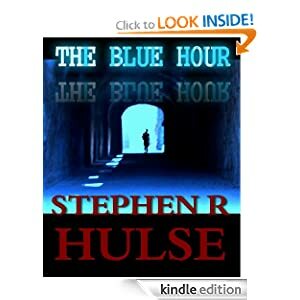 Get this book, read it, and then move on to Shadowchaser – Stephen Hulse is one of the great writers of our times! 'A British girl with a secret. A New York cop with a past. In the slickest, sneakiest twistiest-turniest hard-boiled crime noir novel to come out in a long time, ruggedly pragmatic but honest cop Detective Tommy Connell picks up an English girl, Mrs Jones, who claims to be the witness to a murder, and promptly falls in love with her. 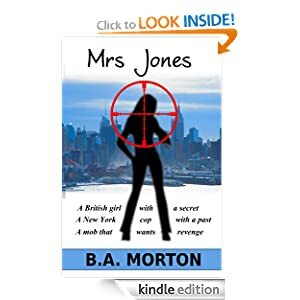 Well, Mrs Jones, whoever she is, must be very attractive because an awful lot of people seem to want to get their hands on her if they can prise her from Connell's determined grasp, including some prominent representatives of organised crime and the Feds. Detective Connell definitely has his work cut out here if he wants to end up with the body of Mrs Jones, dead or alive, that's for sure. All-in-all it's probably safe to say he hasn't a clue what is going on. It is probably equally safe to guess that Mrs Jones does. Connell and Lizzie – ‘Mrs Jones’ – don’t get off on quite the right foot. Not what either Connell, or we, the readers, expect. But Lizzie is brighter and stronger than this introduction to her might lead us to expect. The two central characters in this book are way different from the norm. The detective isn’t just the hardboiled cop – and Lizzie isn’t just the slick, sophisticated woman that we’ve met so many times before (and enjoyed meeting, I have to say!). Here is a new twist, not just in the relationships of the main characters, but in the plot; which is slowly, carefully, and enticingly revealed. I enjoyed reading this book. I enjoyed meeting the characters, I enjoyed working out the plot. I’d be glad to read another Barbara Morton. What else can I say? Go for it! There are lots of really good thrillers coming out on Kindle these days, now that the big publishers can't keep the muzzle on us any more. These are three of my own favourites, and they come highly recommended. And don't forget my first two books, Belfast Girls, and Danger Danger! Enjoy! God bless, and see you soon!